Yesterday, I stopped by Columbia University to do an interview with Gabe Pressman of NBC TV News about the 1968 strike and building occupation that had occurred 40 years earlier. Because it was a beautiful day, I came about an hour earlier so I could walk around the Columbia campus, which unlike Fordham, allows anyone, student or not, to stroll through its gates or sit on the wide, magnificent concrete steps in front of the main administration building, Low Library. For a moment, I thought I was in utopia. The campus was filled with thousands of people of every race and nationality walking to class, taking tours of campus, playing soccer, frisbee and football, sitting or lying in the sun, having conversations and reading books, even participating in a large and passionate anti-war rally. There were people of every conceivable color and complexion, most under thirty, and a proliferation of languages being spoken. I was dazzled and moved by the spectacle. Here, I thought, was a university that brought together the global community in all its glorious variety. There were far more students – and people – of Black, Asian and South Asian descent that I was accustomed to seeing at Fordham or in my own increasingly gentrified Brooklyn neighborhood of Park Slope. Columbia had come a long long way from that fall day in 1962 when the Columbia College class of 1966, of which I was part, arrived on campus, with only 6 Black students out of 660, and an equal, or lesser number of Latinos and Asians. But the longer I stayed on campus, the more my pride in having contributed to this glorious diversity, as a participant in the 1968 protest, turned to dismay. What was missing from this multinational utopia, not only on the campus, but on the surrounding streets, was any working class presence. Of the thousands of people I saw on that glorious afternoon, there wasn't a single person I saw, either on Broadway or the Columbia campus who looked like the people I regularly encountered in the Bronx, whether it was walking up Fordham Road to the "D" train, driving down the Grand Concourse or leading walking or van tours of the Bronx neighborhoods. 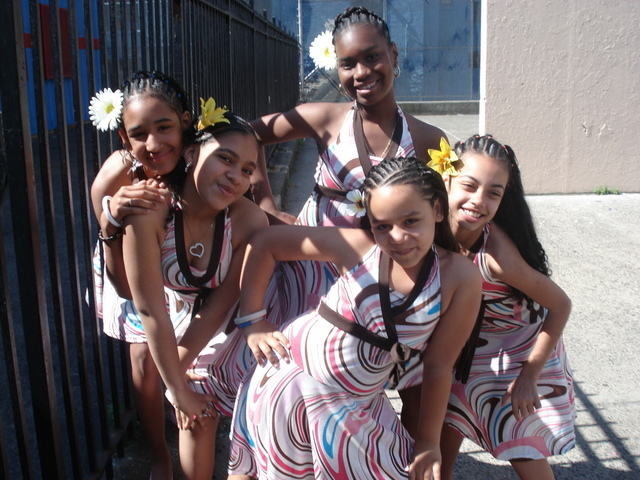 The Morissania Merengue Dancers, PS 140 Schoolyard Jam. Photo by Nicole Vargas, Fordham University. Click image to enlarge. There wasn't a single person I saw, male or female, whose faces bore the stress of working two jobs, to make sure their families weren't evicted, or who displayed a survivor's pride in triumphing over whatever hard times came their way. No women under twenty shepherding three or more children to or from school or a trip to the store. No men outside bodegas sipping beer or playing dominos. No girls in tight skirts, wearing bright lipstick and hoop earrings, raising their voices in laughter. No tall boys in doo rags walking down the street dribbling a basketball. No Mexican or Salvadorian men congregating on street corners before or after a hard days work. No grandmothers sitting on benches exchanging gossip or watching children play. No SUV's or jeeps driving slowly down the street with rap music blaring at full volume. No men in their early twenties walking slowly with their pit bulls, wearing sleeveless tee shirts to show off their muscles. No church ladies talking in animated fashion about Bible study or their preacher's latest sermon. No groups of teenagers, just released from school, gathering in a circle, clapping hands, while one of their number started "Getting Lite" [VIDEO], the latest version of a street dance that was sweeping through the Bronx. These visual symbols of a working class, immigrant presence, which you could see on any spring day outside Fordham's Bronx campus, had been magically excised from the Columbia campus and its surrounding neighborhood, turning it into a place that was as homogeneous in class as it was diverse in race. The process of driving out working class people from anywhere near the Columbia campus, which had begun well before I arrived at the school in 1962, and which I had hoped the 1968 uprising would halt, had been completed with a thoroughness that was truly chilling. By systematically excluding affordable housing from any off campus construction projects, by making sure that no public high school or middle school was built anywhere near the campus, and by allowing market forces to drive rents in the neighborhood so high that immigrant and working class families, and the stores serving that population, could never pay them, Columbia had created a place where its students and faculty were in no danger of interacting on a regular basis with working class New Yorkers. 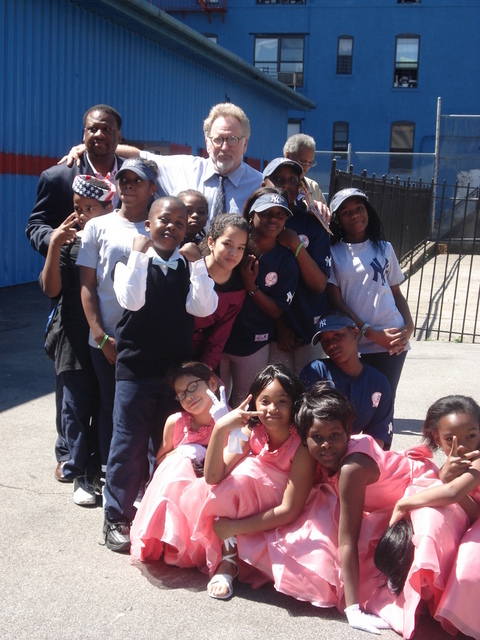 Mark Naison at the PS 140 Morrisania Schoolyard Jam, Bronx NY. Photo by Nicole Vargas, Fordham University. Click image to enlarge. The nearest working class families were now living more than ten blocks from the campus, in five story walkups in West Harlem and Manhattan Valley and in housing projects on 125th Street and along Columbus Avenue. And these enclaves were in danger as a result of Columbia's new expansion plan. This was not the community I thought we were creating when we occupied four buildings in the spring of 1968. Columbia is still following the same policies it did when it tried to build a gym in Morningside Park. Although I got an amazing education at Columbia, I am not proud to be an alumnus of the school. When it comes to dealing with issues of poverty and inequality in New York City, Columbia, 40 years after the historic strike, is still much more part of the problem than part of the solution.